Gardening is a rewarding pursuit. At Milestone, we are in love with the entire garden design process. However, there’s so much to learn, and only so much you can absorb in a single growing season. So we’ve come up with a list of helpful tips to get you started towards designing and growing your lavish green garden! Before you get involved with the physical aspects of bringing your garden to life, such as sourcing, purchasing and installing your plants and accessories, you should have a clear and concise creative vision. You need to invest as much time as possible into really knowing what you want from your garden in advance. Place your plan on paper to help you see how your design elements will work together. This also allows you to make changes as necessary. Planning is essential to growing a lavish green garden. Even if you are just beginning with your garden, you should never “wing it.” Start by learning about your climate and seasons. Even if you are only starting with a few pots of herbs or flowering plants, understanding your climate, rainfall, soil type, and sunlight exposure is very important. All of this will help you determine the types of plants you can grow and what supplies you’ll need. A garden is more than just plants and flowers. It will serve as your backyard sanctuary. Be sure to consider the various areas you want to add to your backyard garden. How will you and your family be using your it? Do you want a sitting area or an outdoor kitchen for entertaining? 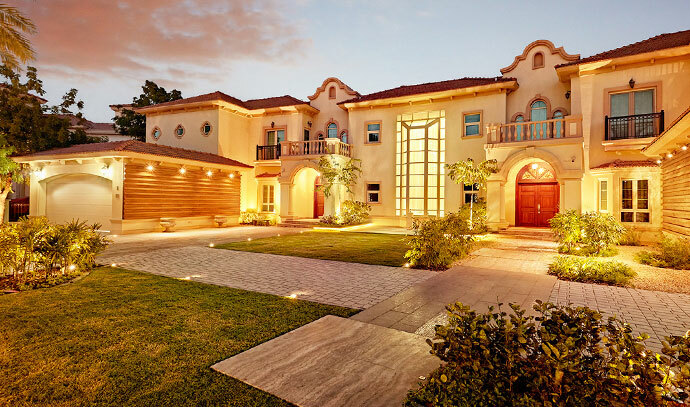 Will you add a pool or fire pit for late night fun? All of these elements must be considered in your garden design plan. So make a comprehensive schematic layout with full measurements to visualise how you will plan all the spaces in hardscape and softscape in your garden along with irrigation and lighting with full details of materials to be used. When it comes to a growing a lush green garden, it’s all about the plants. Deciding what you want to grow may feel overwhelming, but it’s also fun! Are you looking to elevate your garden with lush seasonal flowers in Winter months of October to March in UAE or do you wish to supplement your grocery budget with homegrown fruits and vegetables? In Dubai and UAE climate, growing vegetables may be a bit tough with extreme heat for 6 months of the year but growing herbs like Rosemary , Basil. Lemongrass, Mint and having fruiting trees like Mango, Pomegranate, Date, Chikoo, Lemon, Orange, Papaya, and Fig are possible throughout the year. Tomatoes, Aubergine, Chillies and Cucumbers are some of the other vegetables that can be home grown during the 6 months growing period in Dubai. It’s quite exciting to do your own organic farming and a great learning experience for kids. Do you want an evergreen garden with perennial planting so you do not keep on changing the seasonal flowers all the time, increasing costs and budget? Perennial does not mean that it will keep flowering and fruiting. All plants have their seasons. It will bear flowers and fruits as per their season but when they are not flowering or fruiting, they will not perish. They will shed leaves in fall and will revive back lasting for many years unless attacked by disease and not taken care of. For planting in Dubai and UAE, look for heat tolerant varieties that will thrive in this area and climate. Be sure to plant according to the season, as sunlight and rainfall can make or break a garden. Dubai has negligible rainfall so you must consider adding an automatic watering system to ensure your plants receive the water they require to grow and thrive. No gardener will visit your house 3-4 times a day. Whereas the automatic timer can be set as per need to water the plants 3-4 times in the summer and twice in Winter. If you are going to entertain in your garden throughout the seasons, it’s crucial you incorporate efficient and stylish lighting. Luckily, the broad range of fittings available for your backyard garden is incredibly diverse. Whether you invest in small and flexible spotlights or wall mounted down lights, you can customize your lighting to create the desired shades and angles of light to illuminate your garden on even the darkest of nights. During summer, the outdoor lighting will act as accents to highlight your garden so you can enjoy the views from indoor and in Winter, you will be able to entertain outside, enjoying the features and actually use the garden space effectively. 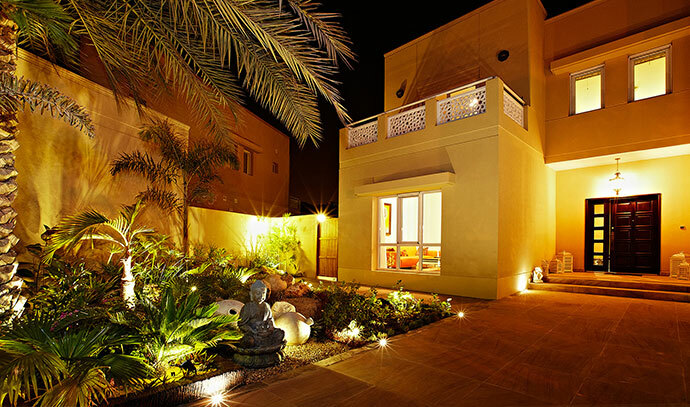 While the design and procurement of unique, custom made furniture are extremely popular in stylish luxury villas, it’s less common in outdoor and garden spaces. Professional designers and carpenters can create one of a kind, bespoke garden furniture to help you cultivate an engaging environment for entertaining. Custom furniture on your patio will add a ‘wow’ factor to your garden, and serve as a talking point for the friends and family you entertain in your new outdoor space. If you are short on space, you can still enjoy a lush green garden. 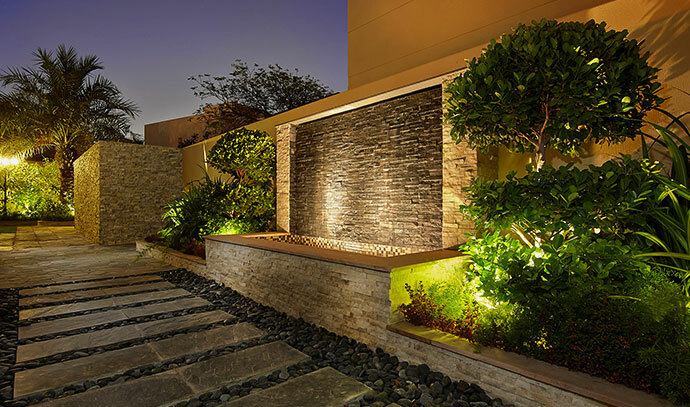 Consider transforming your exterior villa wall into a lush living wall. 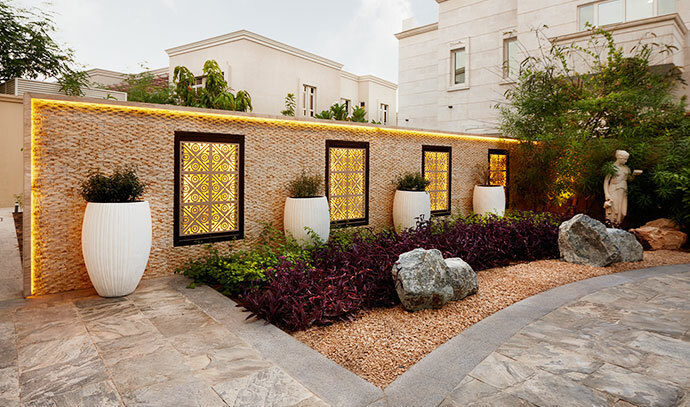 Complete with plants and water features, living walls add an element of natural elegance to your outdoor space, even when square footage is limited. There are few things in life as soothing and naturally relaxing as the sight and sound of water. Outdoor gardens provide the perfect opportunity to add water features and waterfalls to your backyard. 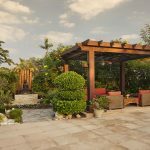 It’s normal to feel overwhelmed when creating an outdoor garden space. When in doubt, turn to the design professionals at Milestone. 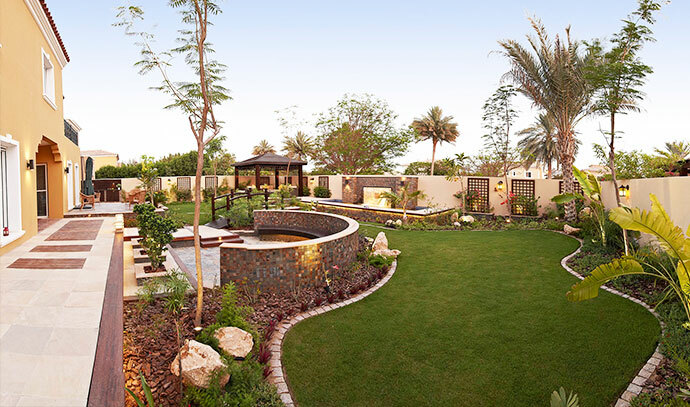 Our team will help you transform your backyard into the oasis of your dreams. If you’ve created a beautiful garden, we’d love to see it. Need a little inspiration, please check our latest design in the Milestone portfolio or visit our Show villa in Jumeira Park.